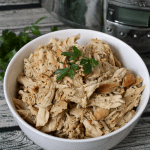 Healthy slow cooker buffalo chicken takes just minutes to prep and can be used for sandwiches, sliders, wraps, salads or nachos! I’m away for a weekend family reunion with my husband’s side of the family. 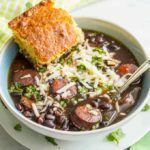 I’ve got another Recipe Redux today with a theme of easy summer slow cooker meals – perfect for when you don’t want to turn on the oven and heat up the house! 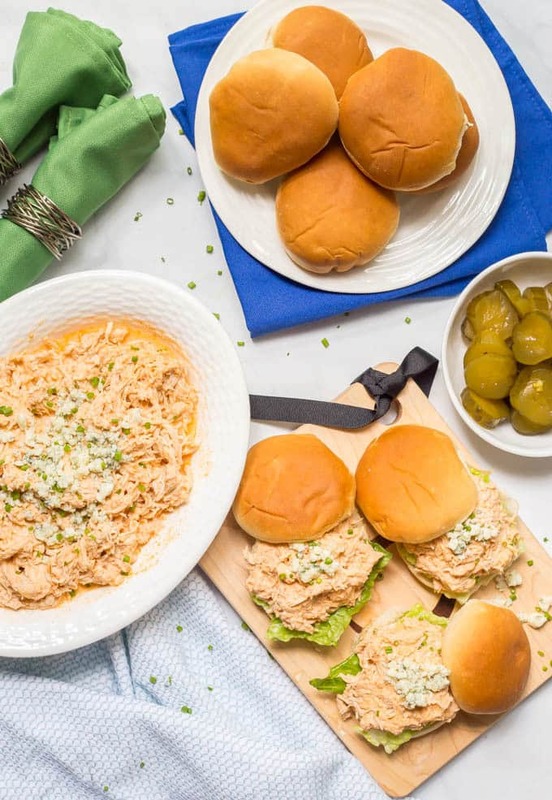 So I’m bringing my healthy slow cooker buffalo chicken, which is perfect for sliders, sandwiches, salad bowls and more! You may remember that I’m ALL about using my slow cooker in the summer. I love being able to stay at the pool a little longer or go for one more bike ride, knowing I don’t have to come home and prep dinner. 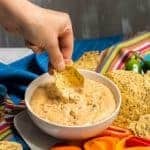 It gets deliciously creamy and silky from the cream cheese and Greek yogurt and then blue cheese is stirred in at the end to add some extra richness and those classic buffalo chicken flavors. 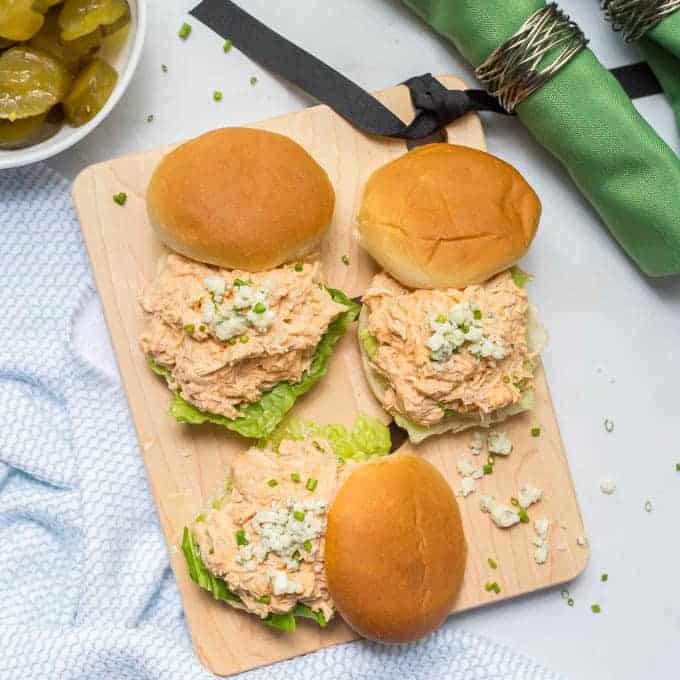 Make sandwiches or sliders, like I did here – perfect for parties! Use wraps or lettuce wraps for a low-carb healthy option. Pile the buffalo chicken onto some nachos for a fun party appetizer or game-day snack. You could put some of this buffalo chicken in potato skins for an appetizer. Serve it as a dip with some celery and carrot sticks and chips. Yum! So you pretty much need to go and make this ASAP. 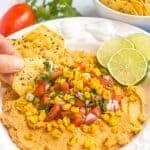 Easy, creamy, delicious and so versatile! 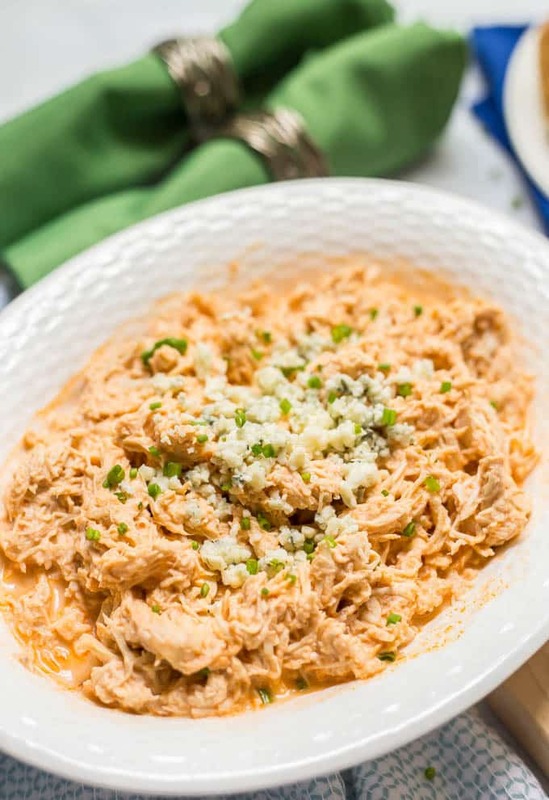 Healthy slow cooker buffalo chicken is lightened up but super creamy and takes just minutes to prep! Add the chicken to the insert of your slow cooker. Add cream cheese, Greek yogurt and hot sauce and stir to mix so everything is spread out and coated. Cover and cook on high for 3-4 hours, until cooked through. 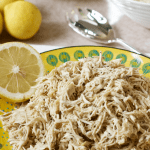 Remove the chicken breasts, shred and return the shredded chicken to the crock pot. Stir into the sauce until well mixed. Stir in the blue cheese and let the mixture sit for about 15 minutes (either off or on warm) to let the chicken absorb all the juices and flavors. 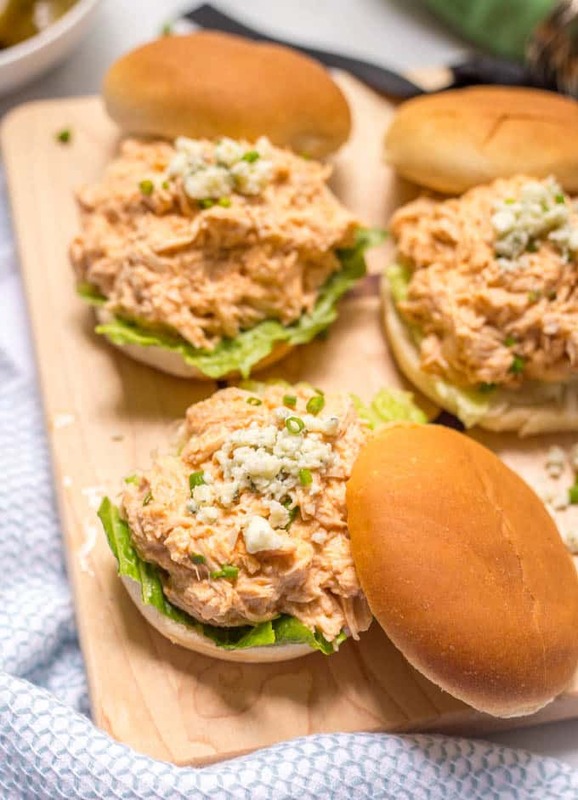 You can serve this buffalo chicken as sandwiches or sliders, as wraps or lettuce wraps, on nachos, in potato skins, as a salad bowl, or as a dip with some carrots, celery and chips. YUMMM! This looks perfect for a party 🙂 We pretty much love buffalo anything in our house. So delicious! Read it wrong and but the blue cheese in from the breginning and it was fine. Also used half the hot sauce because we r wimps!!! I’m so happy to hear you enjoyed it Rachel! Thanks for sharing! This recipe is absolutely amazing. I love buffalo chicken, but I always love to add a little creaminess to it (with wings I use blue cheese dressing) and this stuck a great balance between the spicy and creamy. I didn’t end up adding blue cheese crumbles because they were expensive and I’m a poor college kid, but it turned out wonderful without. I also subbed Greek yogurt cream cheese for the reduced fat cream cheese to rev up the protein content further. Thank you so much!! What is a serving size and how many servings does this make? Hi Sara, it kind-of depends on how you are using it! If you are serving this as a dip for an appetizer, it serves about 10. 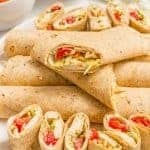 If you are using it for buffalo chicken sandwiches or wraps, you’ll probably be closer to getting 7-8 servings. I hope that helps!